All proceeds raised went to Trans Lifeline. So fetch! On April 13, this lasting cultural power packed The Revue cinema in Toronto, with proceeds going to the Trans Lifeline, but the audience wasn’t there for a screening of the 13-year-old film. Feminist Live Reads stages live readings to “raise awareness of the disparity of roles available for women in film and television and to promote diversity in the entertainment industry.” While men filled out the ranks of the Mean Girls live-reading cast—the event series is normally all-women regardless of the gender of the roles—the infamous core cast, the Plastics, were played by some incredible women. Writer and musician Vivek Shraya took the lead as Cady Heron, while her frenemy, queen bee Regina George, was expertly served by actor Michelle Mylett. Mylett was flanked by Naomi Skwarna as Gretchen Wieners (whose hair is so big because it’s full of secrets) and Vanessa Matsui as Karen Smith (the aforementioned mouse). Mylett, Skwarna, and Matsui should consider taking their Plastics act on tour; it was that delicious. Like Regina’s mom’s breast implants, other standouts included actor Ennis Esmer as Principal Duvall, and the scene-stealing Jesse Todd as “too gay to function” Damian Leigh. One of the joys of the live-read setting, especially of a cultural artifact like Mean Girls, is most of the audience knows which lines are coming. In the case of Todd, the crowd would go silent and then crack up at his adorable delivery. Further surprises came in the appearance of comedian Jan Caruana as Ms Norbury. Caruana appeared in the original movie as Emma Gerber, but she had maybe one entire line in the script. As the ill-fated teacher, she made a fantastic addition to the cast. Likewise, David Reale, advertised as “the original Glen Coco” (“You go, Glen Coco!”) joined the cast as Cady’s dad and ensemble voices, and was a pure delight. Feminist Live Reads’ Mean Girls was less a feature show and more of a cultural experience; I was reminded of shadow-cast screenings of the Rocky Horror Picture Show. The audience knows what’s coming, but there’s a certain comfort and joy in reliving it with friends. 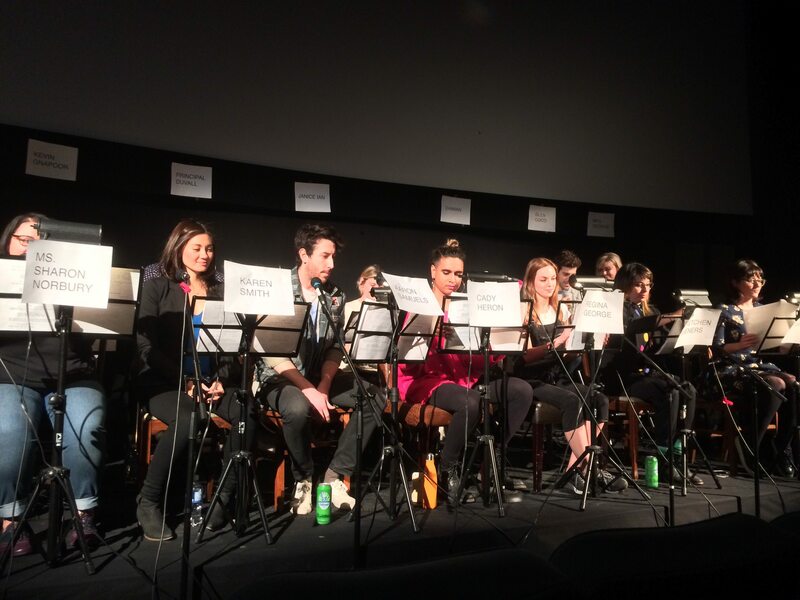 The wonderful organized chaos of the live reading added an intertextual level to the original script. One example was when Matsui as Karen delivered my beloved “If you’re from Africa, why are you white?” line to Shraya (as Cady), who is not white. That tension is delightful and dynamic to see play out. What a bright time @RevueCinema!